AWARD-WINNER IN THE "CHILDREN`S BOOK: HARDCOVER NON-FICTION" CATEGORY OF THE NATIONAL BEST BOOKS 2009 AWARDS, SPONSORED BY USA BOOK NEWS! In this whimsically-drawn and thoughtfully-told story, children learn what it means to be global by visiting the pyramids, eating sushi, celebrating Kwanzaa, and learning how to say “hello” in Swahili. 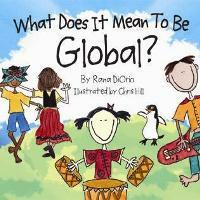 The book is a conversation starter for parents and educators to teach children about the goodness in exploring, appreciating, and respecting other children`s traditions, religions, and values the world over. Recommended for ages 4-8 but people of many ages will enjoy! Type: What Does It Mean To Be Global? Size: -1 8.5 x 10"